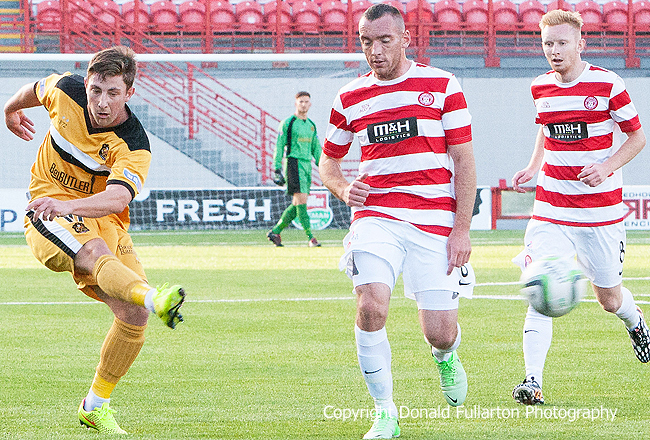 DUMBARTON gave a good performance in a pre-season challenge match against newly promoted premier division side Hamilton Accies at New Douglas Park, but lost 3-1. Home striker Mickael Antoine-Curier was the difference between the teams, opening the scoring from the penalty spot and then adding two fine goals in the second half for an excellent hat-trick. Sons, fielding new men David van Zanten and Scott Taggart and a trialist goalkeeper from Aberdeen, started positively and had the better of a competitive first half. Soon after the penalty Jordan Kirkpatrick levelled the score against his old club with a great strike from the edge of the box, and he had two more similar shots blocked. The home side had the better of the second half as several substitutes entered the fray, including Sons trialists Craig Sutherland and ex-Morton winger Archie Campbell. Sons best chance came when Garry Fleming's header was saved by keeper McGovern and Kirkpatrick hit the rebound over the bar. The picture shows Kirkpatrick firing in a first half shot.